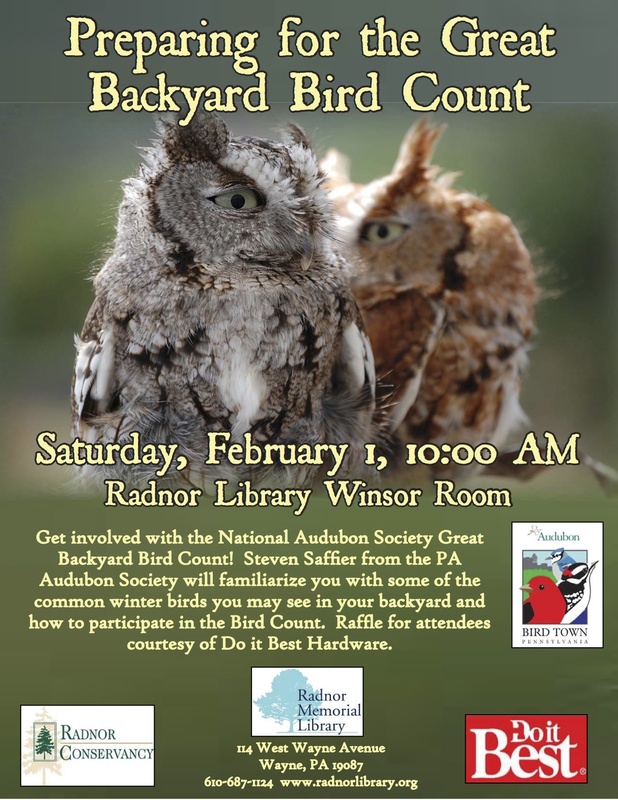 Wayne, PA – Saturday, February 1, Steven Saffier of Audubon Pennsylvania will present about the value of the Great Backyard Bird Count, which begins February 14 and runs through the 17th. 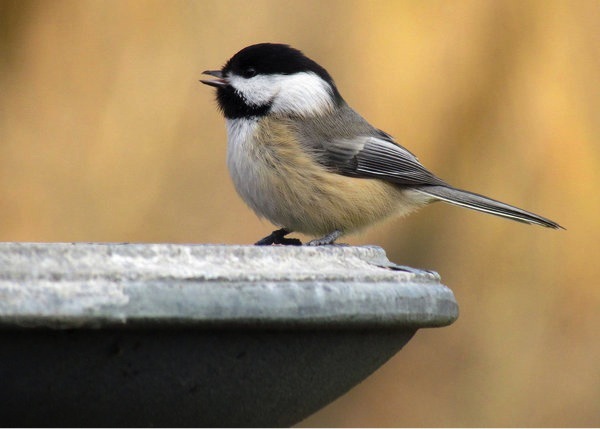 The Great Backyard Bird Count is a program of Citizen Science. This is the 16th year for this successful program, which submits valuable information to the Cornell Lab of Ornithology. Each year over the four-day President’s Day weekend, people of all ages and bird watching experience are encouraged to look outside at their yard and count the birds they see. Checklists are then entered into an online database where participants can also find more information about birds. The website also offers kids’ activities and Top 10 lists from prior years. The web tools are intended to introduce backyard birdwatching as a fun and engaging activity that truly contributes conservation science to Audubon and its partners. The GBBC takes place February 14-17, 2014 and is free and open to everyone. Participants are asked to spend a least fifteen minutes on each of the four days to count birds in backyards, schoolyards or parks. Pennsylvania is annually among the top states in number of contributed checklists and seeks to dethrone winning states such as New York and Florida. 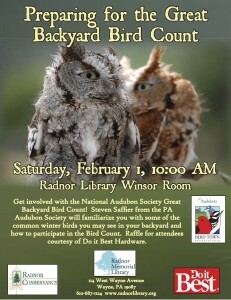 Steven will highlight fifteen of the most common backyard birds and talk about the value of the GBBC. Additionally he will discuss the basics of bird watching, how to identify birds using behavior, field marks, etc. Also there will be information about bird seed and feeders. 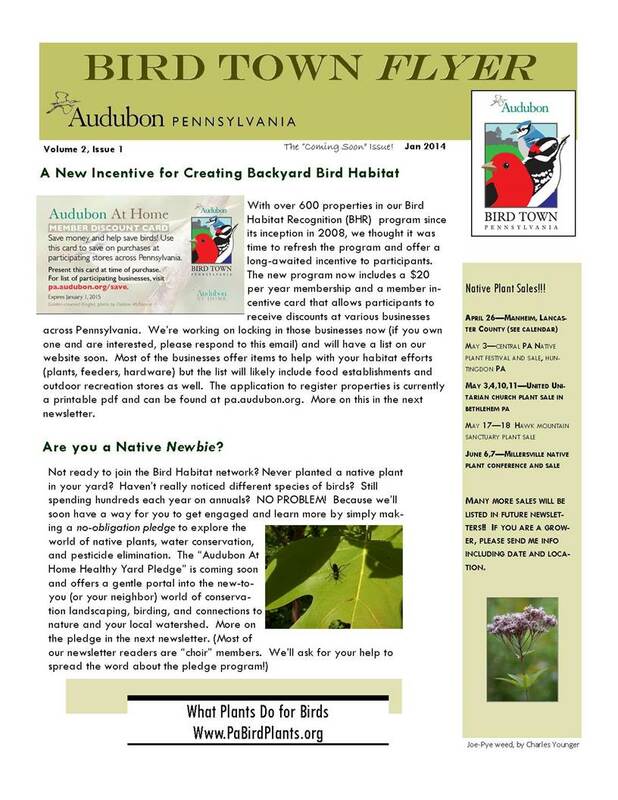 Radnor’s version of the Audubon Society‘s Bird Town initiative was established in 2013 in association with the Radnor Conservancy and the Radnor Township Environmental Advisory Council.